It’s been some months since you’ve heard from the home front, but that doesn’t mean we haven’t been thinking of you, or that we haven’t been busy out here in Boston since our last Clinic. Rather than last, I should say our recent past Clinic, because the 57th Annual Clinic in March of 2011 was a resounding success, and we want to be sure to thank all of our Associates and members for their help and support. Over the past six months, there have also been a few changes in the Club’s overall structure and personnel. It has been my honor to be the President of the Boston Sea Rovers for sixteen years, but it was also time for a new voice and vision to help lead the organization. I could think of no better time to step down than after a successful transition to a new venue, and I could think of no better candidate for the drastically underpaid, overworked job, than our new President, Ethan Gordon, whose nomination was accepted unanimously by the Board of Directors. All of you are well aware of the contributions that Ethan has made to the overall dive industry over the past decade(s) through his work as a photographer, writer and editor/publisher, and he’s been equally busy with the Sea Rovers. 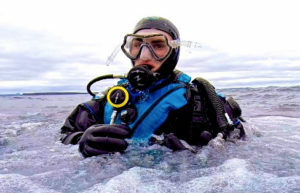 His knowledge of the dive industry, combined with his great artistic eye, design style, and business experience are surely a winning recipe for success. While I have stepped down as President, I will still be actively involved with the club, and remain the Evening Show Chairman. Ethan has appointed two new officers of the club (also with unanimous board approval) to help guide the club, and I’m pleased to announce that Mike Zappala and Kate Douglas are the new VP and Secretary, respectively. Heather Caldwell remains our extremely capable treasurer. Other personnel changes have also occurred at the Board level. Over the past several years, Brian Skerry’s free time has been shrinking at an exponential rate, as more and more people around the world have become aware of his talents, abilities, and skills. He’s been juggling multiple projects for National Geographic for years (a skill that many circus performers would love to have), and with his volatile and hectic schedule, he respectfully submitted his retirement from the Board. His presence and guidance over the past twenty-plus years (he’s been a member for over twenty five years, and was President for three) was instrumental in much of the success that the Sea Rovers experienced, and I’m sure that he will be checking in every now and then to make sure the good ship Rover stays on track. The Board of Directors elected me as the new Chairman, and the full Board now consists of Don DeSantis, George Buckley, Heather Knowles, Ethan Gordon, and myself. All of the Board know that we have our work cut out for us, ensuring that the club remains successful in these increasingly volatile economic times, but we all share a deep and loving commitment to the Rovers, diving and the underwater world, and are up to the challenge. Finally, I encourage each and every one of you to join us in Boston (OK, Danvers) next March for our 58th Clinic, on March 9th-11th. See ya in March!